The next-gen iPhone (supposedly iPhone 5) is the most anticipated gadget of 2012. With the iPhone 5 just around the corner it quite obvious that people will be interested in searching for the right kind of iPhone 5 applications which can make the device with new capabilities. Talking about the cons of Apple devices, what enters our minds first is lacking video compatibility. Again, iPhone5 also only supports MP4 video formats (H.264, MPEG-4 video codec). Is it possible to play self-made WMV videos, downloaded YouTube (FLV) videos, HD Camcorder (e.g. : .mod, .m2ts) videos on the upcoming iPhone 5? The answer will be yes with the help of third-party video converting software. However, the conversion takes time, which is a pain. Now an alternative way of transferring media content is going to resolve this - streaming audio video to iPhone 5 wirelessly with the help of Air Playit. Air Playit is a free audio video streaming app for iPhone 5, which enables to convert 320 different audios videos on the fly and stream audio video to iPhone 5 with Wi-Fi, 3G and 4G network. Using this app, it is easy to play video in any format, such as MKV, M2TS, AVCHD, AVI, and WMV on iPhone 5 in real-time without any pre-conversion. 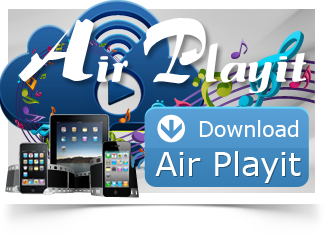 How to stream video and music to iPhone 5 with Air Playit? There are 2 components to making this iPhone 5 video streaming app to work: a media server which is installed on your home PC or Mac and an app client for your iPhone 5. The server can be used to manage your video collection and choose which individual files and folders should be made available. Then the app client will interact with the server and play the streaming videos on iPhone 5 over the air. Free download and install Air Playit App Client on iPhone 5. 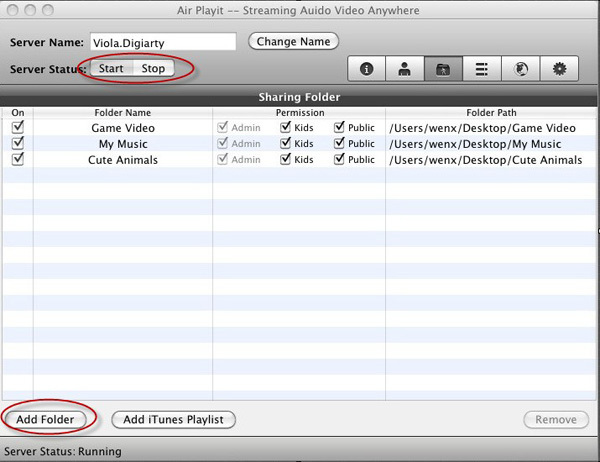 Step 1: Run Air Playit Server and add any videos, movies or music from your PC/Mac to "Sharing Folder". Do make sure your server is in start status. Step 2: Run App Client on iPhone 5 and add your server. This app can automatically discover the local network by Bonjour Server. If Bonjour connection information cannot be found, specify the IP address by yourself as follows or close the firewall for a try. You can also add remote server by specifying IP address. Step 3: Browse the folders under the server and choose the video/music you need, simply click "Play" to watch video/music on your iPhone 5 via Wi-Fi, 3G or 4G wireless Network. Step 3: Click on "Offline Conversion", find the converted file in "Air Target", download it and play. The whole process can be considered as an on demand streaming which costs only little usage of bandwidth and enables offline playback in case of no network. Here I'll introduce you a comprehensive video streaming app Air Playit which provides the most efficient way of streaming Blu-ray movie to iPad/iPad 2. It converts video on the fly and streams video to iPad, iPhone, iPod touch and Google Android OS mobile devices via WiFi and 3G/4G network. Though there are so many marvelous cloud servers in the market such as Apple iCloud, Google's cloud and Amazon's cloud, Air Playit still stands out for its special audio/video streaming ability. It is a new, powerful yet free personal home video music cloud server for streaming MKV, AVI, WMV or any other videos on iDevices.